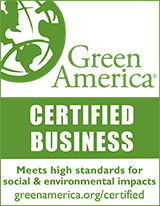 Our Organic All-Cotton mattress covers and pillow encasings are made of unbleached 100% GOTS (Global Organic Textile Standard) Certified Organic Cotton, so you know you have the best quality available. 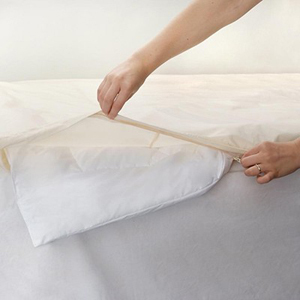 Anti-allergy mattress covers are one of the most doctor-recommended ways to reduce dust mite allergen exposure and get protection from bed bugs. Learn more about these organic cotton mattress covers below. BedCare is your first step to a healthy, better night's sleep. Our Organic All-Cotton Mattress Encasings are made of unbleached 100% GOTS (Global Organic Textile Standard) Certified Organic Cotton so you know you have the very best quality available. 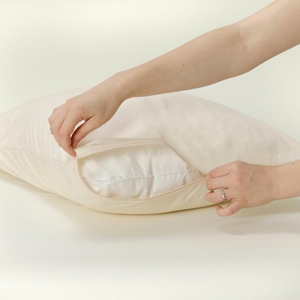 With a pore size of just 4.8 microns, only air can permeate this tightly woven fabric, for total protection from dust mite allergen and bed bugs while you sleep. The quality of these zippered mattress covers is guaranteed because of the care American craftsmen put into each and every one. Even the most discriminating cotton lovers will be delighted with Organic All-Cotton mattress encasings. Twin 15" and Full 15" covers do not employ heavy gauge nylon zippers with coated rust proof metal zipper pulls. Comforter Covers: Twin 66x86, Full/Queen 86x86, King 106x86. Mattress Cover Heights: 9", 12", 15", 18". Not all sizes available 15", 18". 100% Organic Cotton for the ultimate in comfort without sacrificing efficacy. Certified Organic by the Global Organic Textile Standard (GOTS), ensuring the fabric's organic status from harvesting of raw materials through environmentally and socially responsible manufacturing. No chemicals, dyes or any added treatments whatsoever! Uniquely sanforized to prevent shrinking and maintain the integrity of the pore size through multiple washings! We use only heavy gauge, rust proof nylon zippers. Air permeability reading of 5, which indicates a wonderfully cool fabric. Vacuum the entire surface of the mattress encasing every 10 to 14 days to capture any allergens that may have settled on the surface. For best results, consider using a HEPA vacuum or allergen-proof vacuum bag. When laundering, close the zipper and machine wash the mattress encasing when needed in WARM water and natural laundry detergents such as "Ecover" or "Seventh Generation". Additional shipping charges apply for Hawaii, Alaska or overseas shipments. Call for more information or assitance in choosing the product that is right for you: 866 388 5154. 100% Organic Cotton Mattress Encasing - Crib Choose Cover Depth Crib 27" x 52" x 6" $109.99 $98.99$98.99 On Sale! 100% Organic Cotton Mattress Encasing - Twin Choose Cover Depth 9" Deep 12" Deep $184.99 15" Deep $194.99 $174.99 $157.49$157.49 On Sale! 100% Organic Cotton Mattress Encasing - TwinXL Choose Cover Depth 9" Deep 12" Deep $209.99 15" Deep $219.99 $199.99 $179.99$179.99 On Sale! 100% Organic Cotton Mattress Encasing - Full Choose Cover Depth 9" Deep 12" Deep $209.99 15" Deep $219.99 $199.99 $179.99$179.99 On Sale! 100% Organic Cotton Mattress Encasing - Queen Choose Cover Depth 9" Deep 12" Deep $229.99 15" Deep $239.99 18" Deep $249.99 $219.99 $197.99$197.99 On Sale! 100% Organic Cotton Mattress Encasing - King Choose Cover Depth 9" Deep 12" Deep $249.99 15" Deep $259.99 18" Deep $269.99 $239.99 $215.99$215.99 On Sale! 100% Organic Cotton Mattress Encasing - Cal King Choose Cover Depth 9" Deep 12" Deep $249.99 15" Deep $259.99 18" Deep $269.99 $239.99 $215.99$215.99 On Sale! 100% Organic Cotton Comforter Encasing Choose Size Twin 66x86 FU/QU 86x86 $250.95 King 106x86 $307.95 $194.95 $175.46$175.46 On Sale!